Do you have questions on your order, on a specific fabric or do you need help regarding questions to the manufacturing? Please use our professional advice. Contact. Become a member in our free (of charge) Fabric Club and receive with each order 3% discount in the form of e-points for your next order. To the van Soest Fabric Club. New fabrics, actual trends, actual colours and designs. 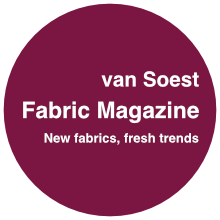 With the van Soest Fabric Magazine you keep up with all trends. Order the magazine here van Soest Fabric Magazine. van Soest fabrics is official TENCEL® deliveries. We will be pleased to send license numbers on request. Order now TENCEL® Meterware under TENCEL®, CUPRO® & ROLVA® fabrics. You can also ask us an individual question. Please fill out the following form correctly.